Yes I know - sometime ago but it is a chase report. This is one of the chases that somehow escaped a write-up. And not like it was a shabby storm chase. After all, Nick Moir did one of his special tricks - well not mobile phone special but jumping the fence special - breaking his ribs! 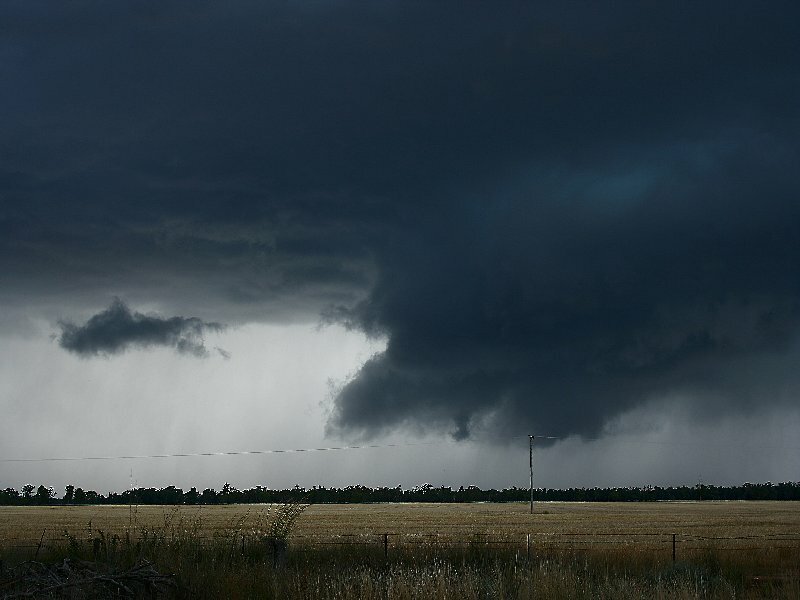 After a week of extensive severe storms in the Central West, I headed our on the 25th November 2005. With reasonable CAPE, decent wind profile and dry air aloft linked with a short wave, I decided to chase. My target was Mendoran to Gilgandra. And it was here that the first interesting and active cell had developed. In fact there were a cluster of cells. The cell west of Mendoran was along the trough line and seemed to have a rain free base and possible wall cloud on the southern flank - right mover? I could hear louder thunder in the distance to the west but could see nothing. 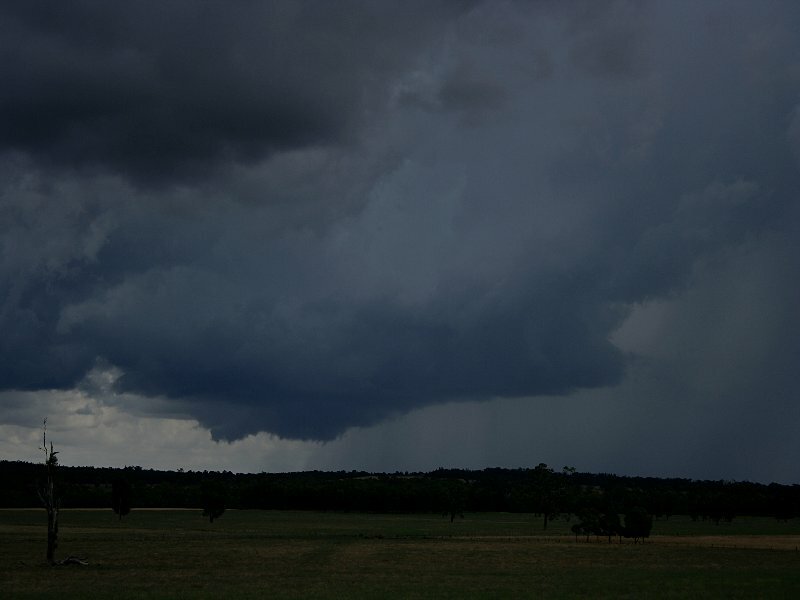 I then headed back to Mendoran in case the eastern cell took off. It dumped heavy rain but escaped in no man's land. 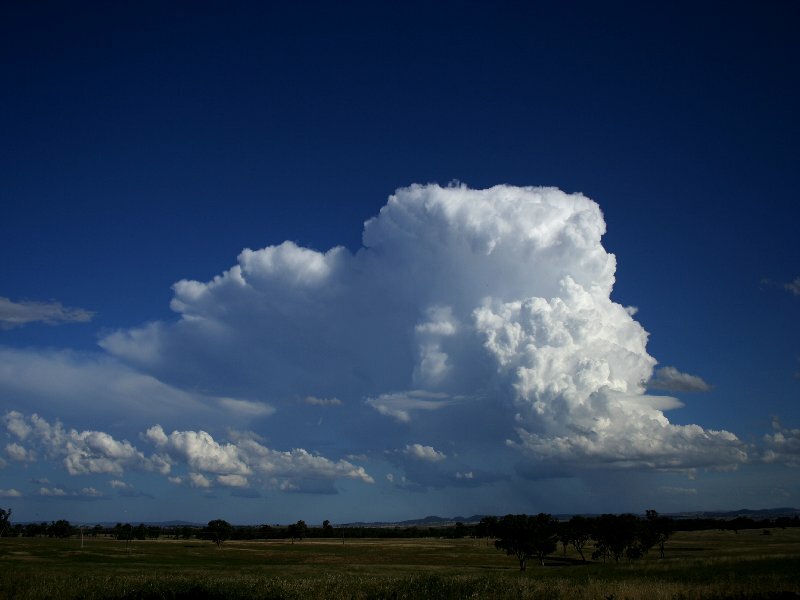 Heading north towards Coonabarabran, I noted a nice crisp anvil. Now the adrenalin began to pump because I knew this was the missing link - the left mover I could not see earlier! Finally, on an elevated clearing near Coonabrabran, I could see an awesome structure! 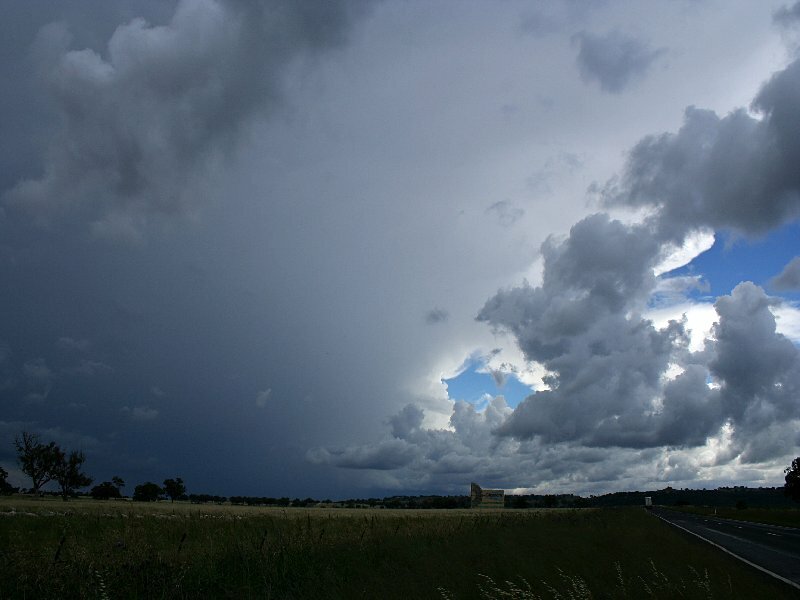 A wall cloud came into view and a sharp clear and crisp side sheared anvil. This was a severe storm and on the move north - sharp left move likely traversing the boundary. Rotation was evident and the upmotion was distinct! After some timelapse, I opted for a closer vantage point and was able to get very close but with hill in the way. With the storm about to head over the hill, I knew I was in for a good view in case anything happened. Well the storm went into collapse mode. 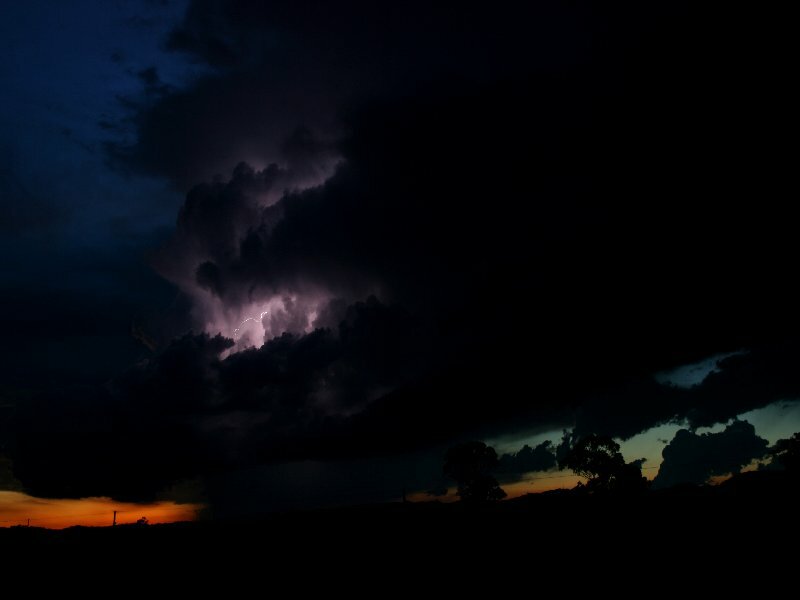 A shelf cloud and outflow a result. Finally making it back to Coonabarabran, it became a frustrating afternoon. The towers were struggling and it became reasonably hot. I made it all the way to Baradine. I just found a tree and waited. And waited. The storm to the south seemed to struggle and then finally on about 5pm, exploded! 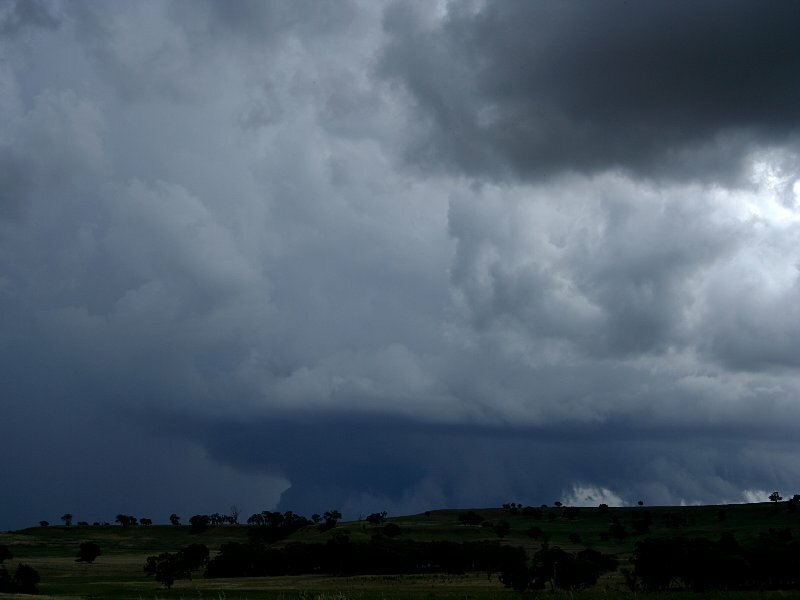 From a perspective 15kilometres west of Baradine, the next updraft also sent a side shear outwards and gradually I was able to block out the sun and improve the contrast. After some timelapse, I prepared myself for a direct hit of the cell. It certainly was not violent but it did produce some heavy rain and for a period of about 15 minutes hail pelted down - it was a refreshing sound on the vehicle. The downdrafts, also did the usual about face as the storm finally headed north. After the storm, I went down the road and sampled hail size. 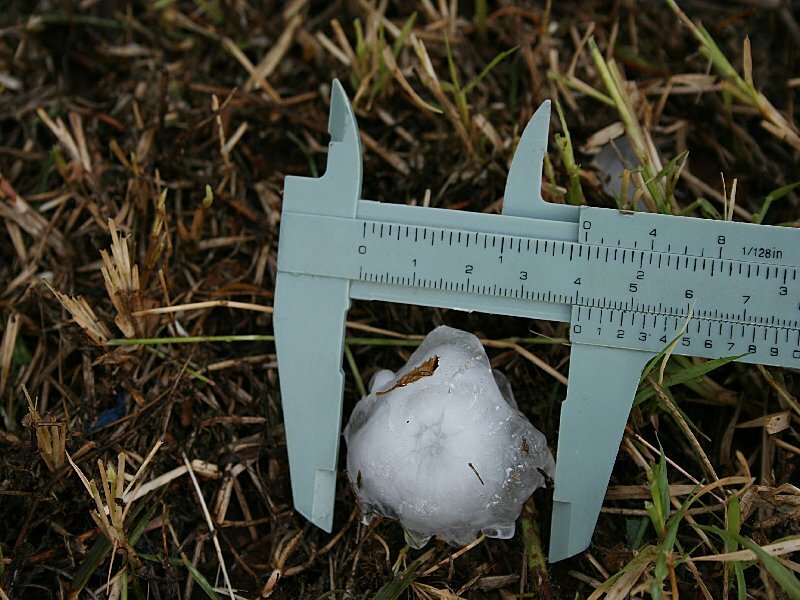 Quite surprisingly, I ended up where I had been in the storm to measure the largest hailstones. 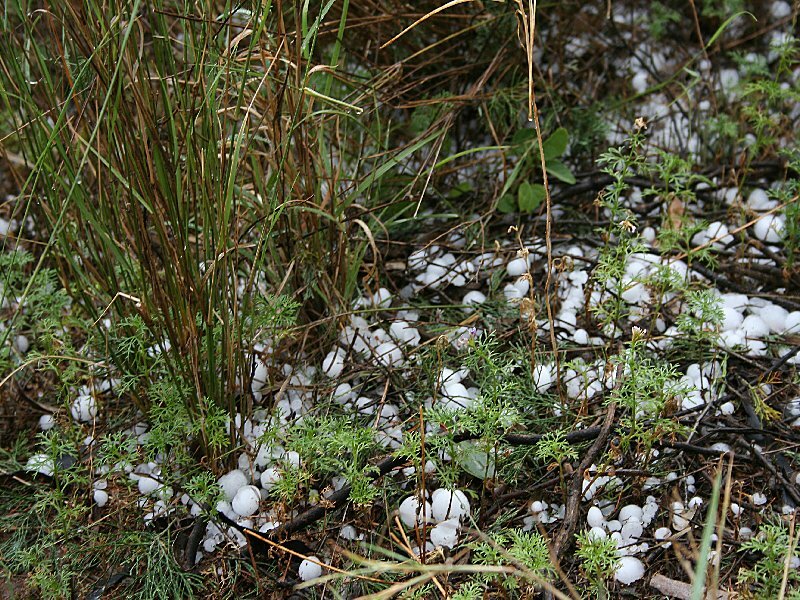 My suspicions were correct, hailstones were up to the size of about golf balls. It was a long day and I was hungry after a small lunch earlier. I settld for a pizza in Coonabarabran - some of the best pizzas I had ever tasted! After booking a motel, I headed out to the airport to view yet another cell drifting over the Warrumbungles from the north. It was certainly active and made for a peaceful and spectacular sunset. Nick Moir finally joined me in the motel and we shared the days frustrations and triumphs of the day and discussed the next day's chasing. This turned out to be an exciting forecast on paper. target Coonabrabran. We needed to go nowhere. I hate those sort of days because you end up waiting and waiting for the storms to develop. the trough was to be to the west but there was the possibility that storms would fire locally. 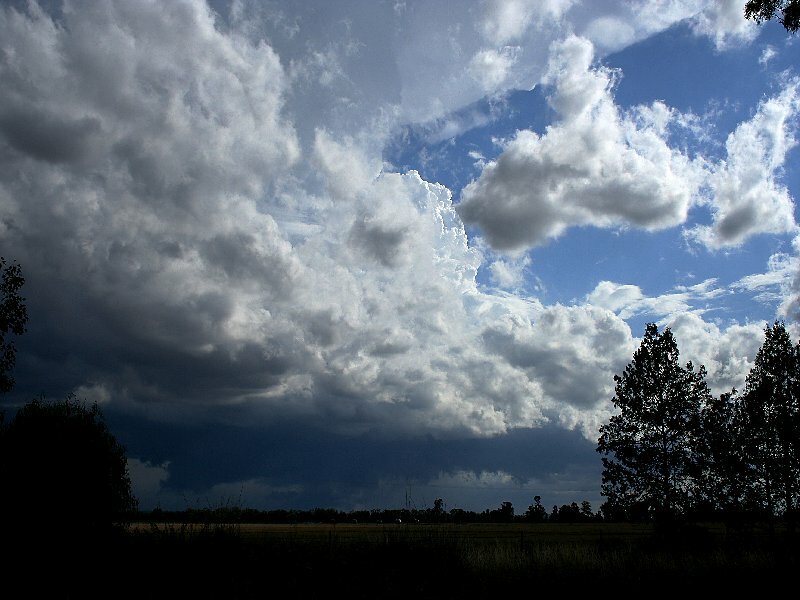 Well, large cumulus did develop locally and the storms also fired along the trough line. 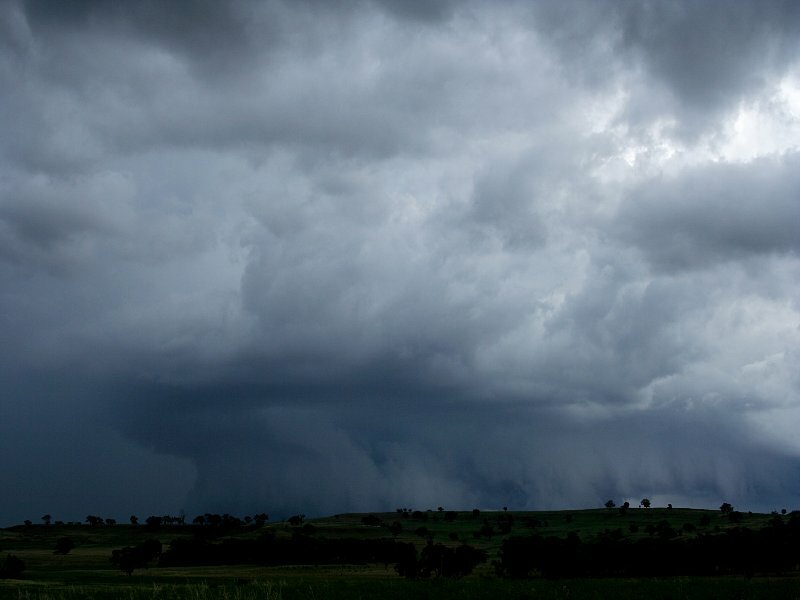 Nick and I gave chase to a promising cell to our south but as we were nearing, it became ill defined. And it only produced a shower by the time we got to it but some thunder as well. It became clear the trough line would be the main play. We headed west towards Elong Elong but then we stopped. I felt I was heading away from the target and headed back well east and north towards Premer. A severe high precipitation supercell seemed to be evident to the northwest but we decided it was too late to see it in daylight so we opted for the lightning show. The lightning was all around us particularly to the south and also northwest but initially not close by. 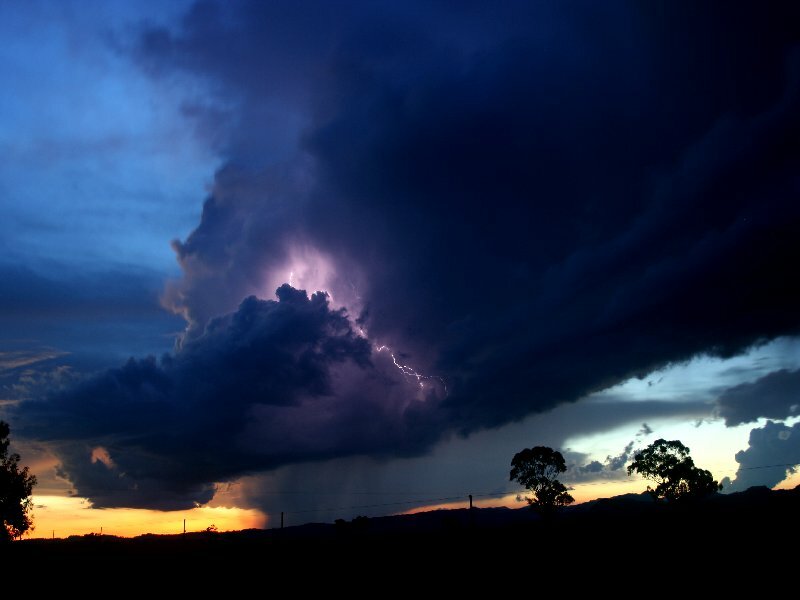 Gradually the sourthern cells encrouched upon us treating us to some downbursts raised dust and unpleasant conditions as well as some loud thunder and lighning bolts. 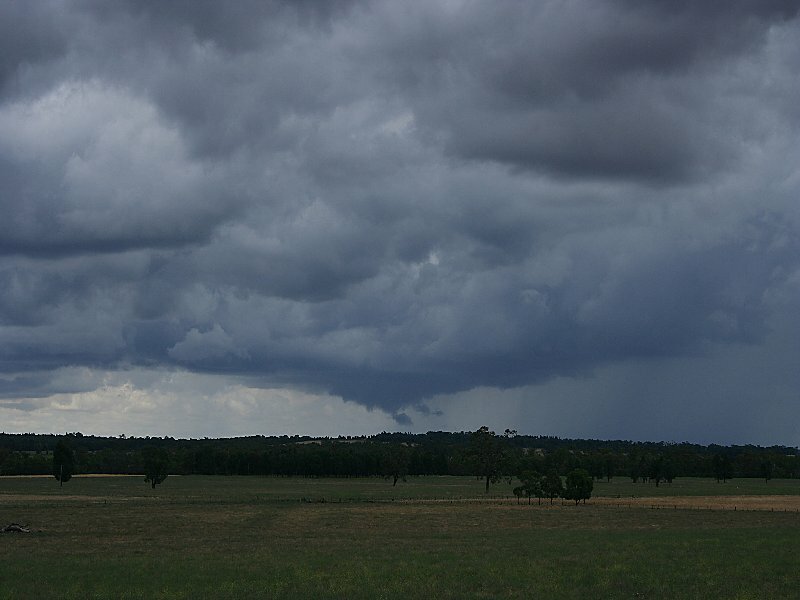 Retreating further north, were in a much better condition to see the cell from the north west approaching Tamworth. 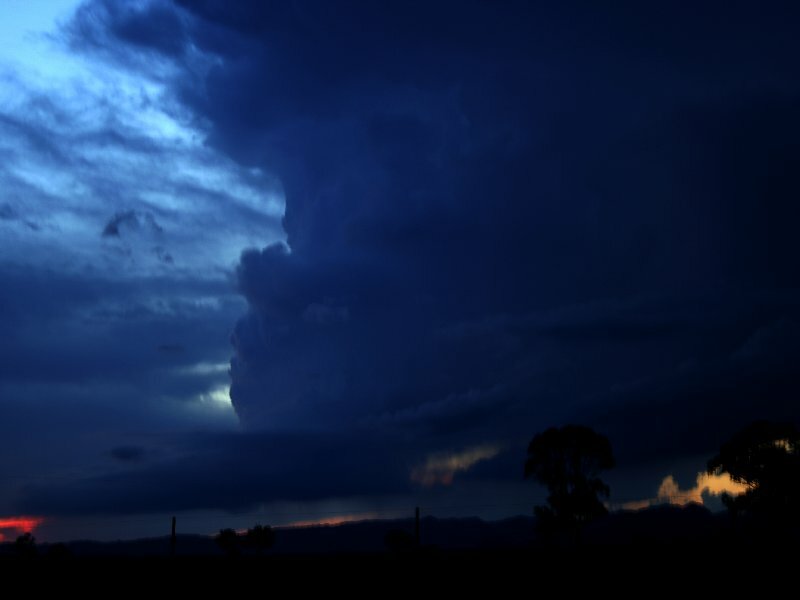 This sent some bright hot bolts and deafening thunder echoing through the valley. Wow! What a barrage! Having not eaten even up to this point, we were lucky Tamworth was a lively city. After dinner, we headed for the motel to rest after an exhausting day. 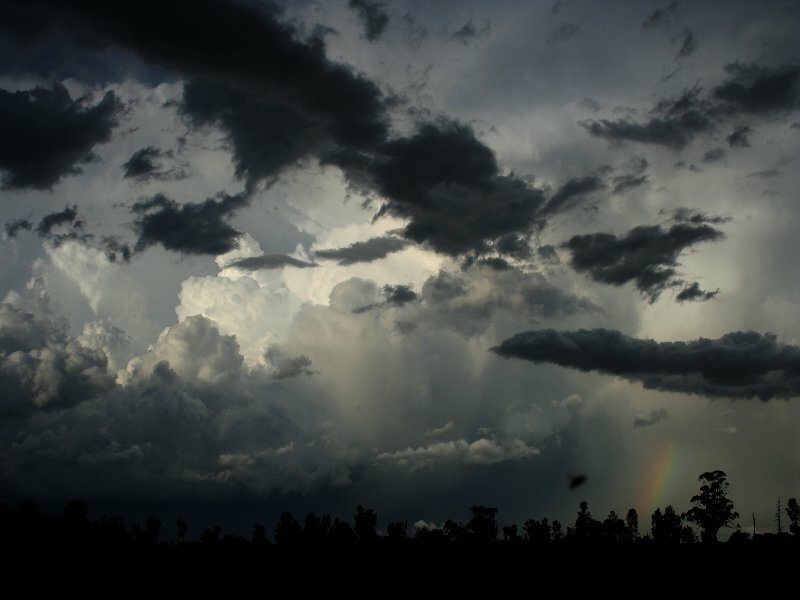 More storms disturbed the city during the night. Awaking on this day, Nick and I knew it was important that we make a move into the Northern Tablelands. The wind shear was more ideal and the upper trough would be active early in this area. Armidale was a good starting point. 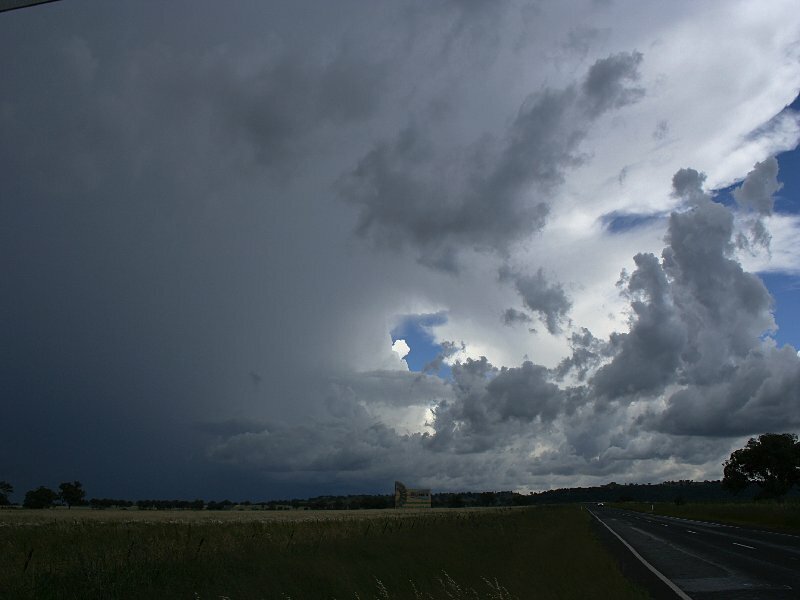 Approaching Armidale, an anvil streamed over the horizon. Positioning ourselves on the eastern parts of town, the cell gradually progressed revealing its structure. 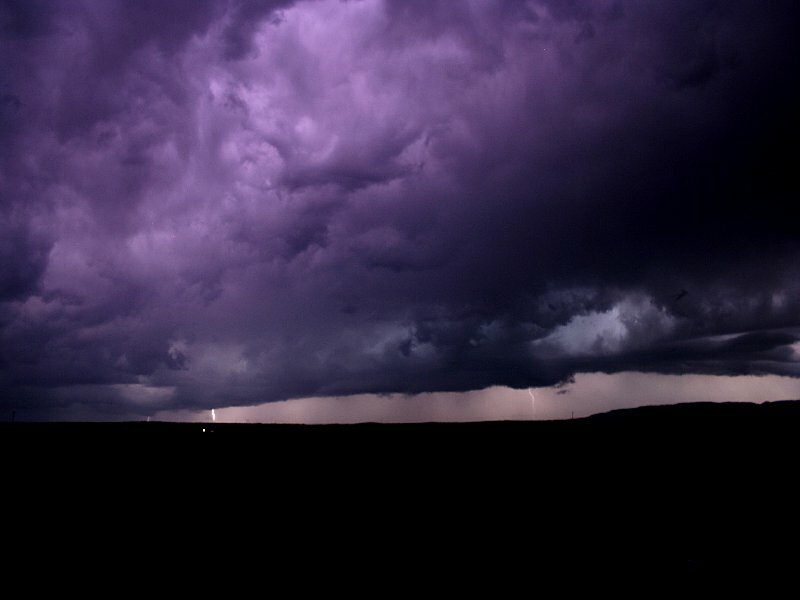 There was obvious rotation and some healthy lightning bolts - upper trough behaviour. 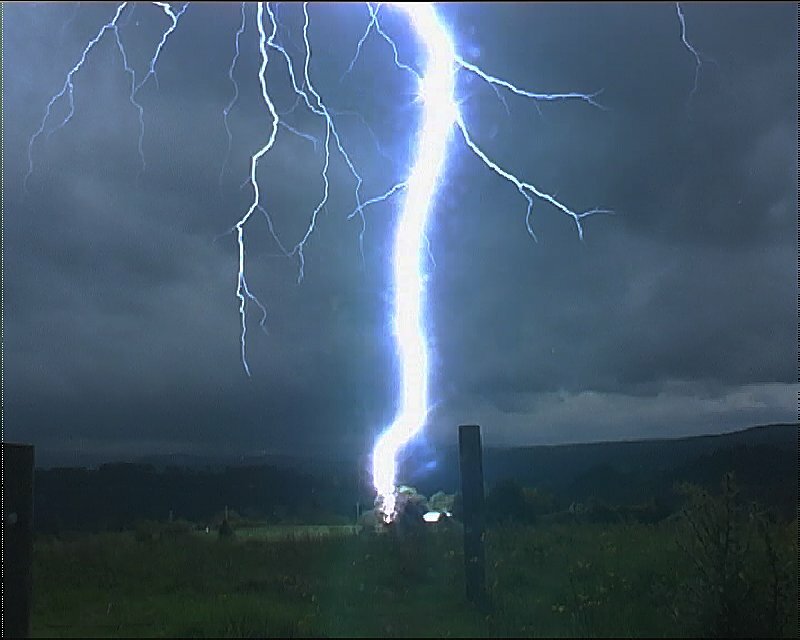 Nick captured some awesome bolts with his professional camera setup. 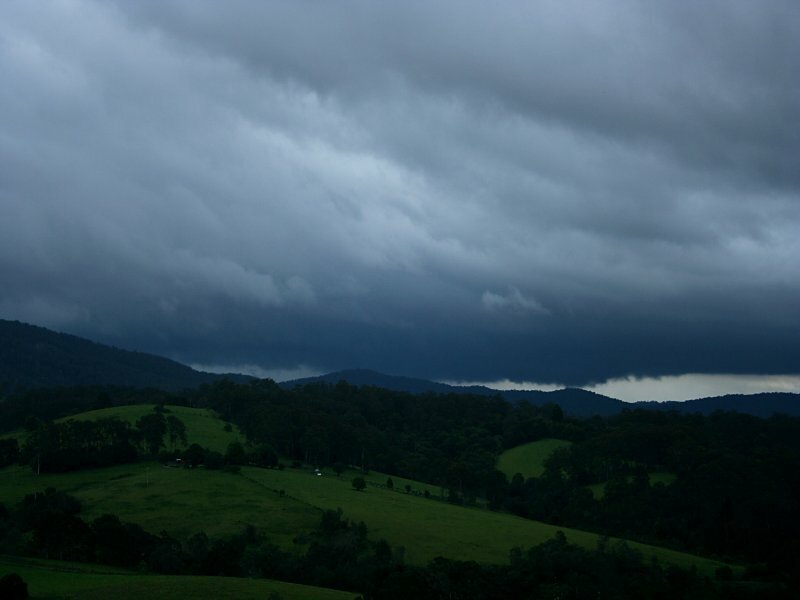 As the rain disturbed our session, we opted further east and had no choice but to head to Dorrigo. 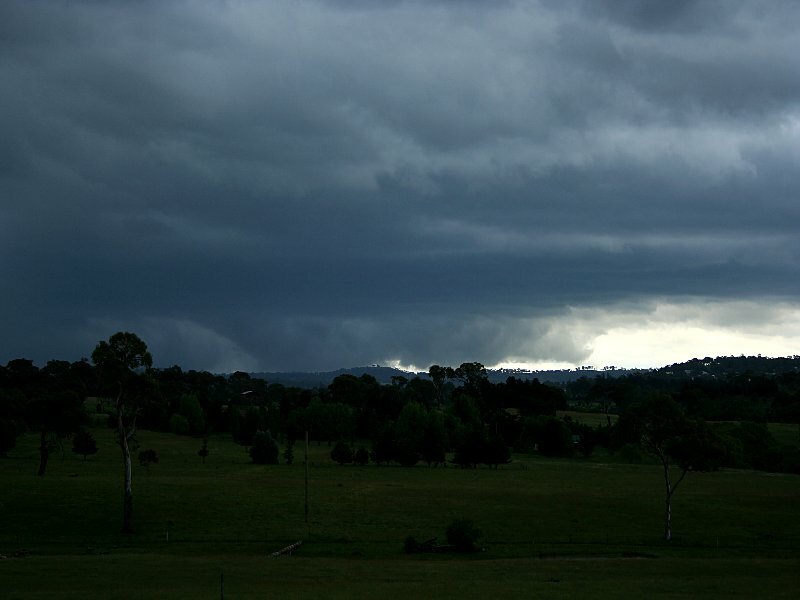 I like Dorrigo when storms are active. 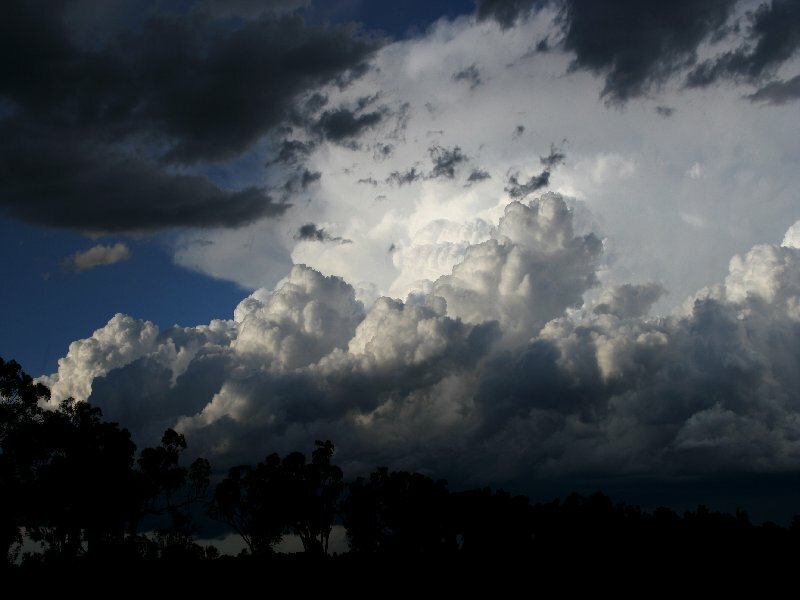 You know that storms are more favourable in the area and can develop rapidly due to the terrain. Winds and low cloud were racing from the northeast. 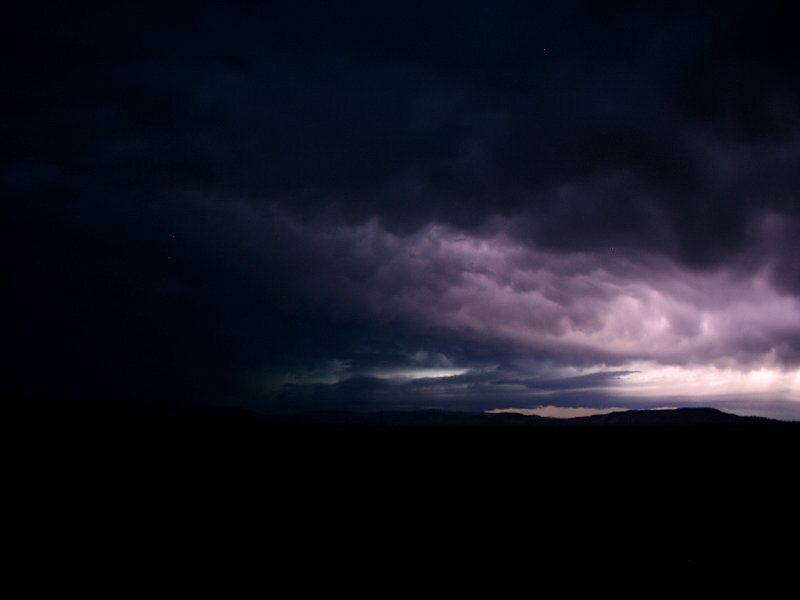 The first storm could be heard as loud thunder and distant lighting - well the perception of distance brought about due to the low cloud. 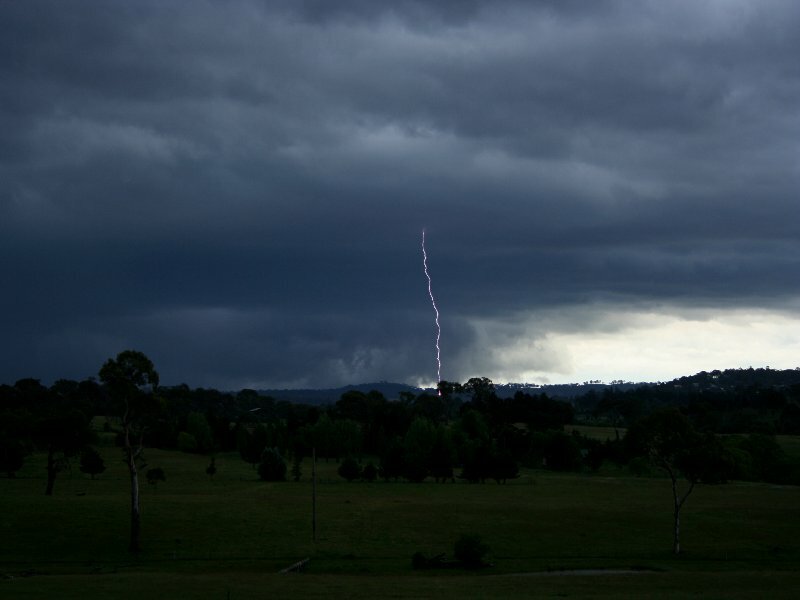 There were some very severe bolts ripping the Dorrigo Plateau - something they get used to here. This first storm seemed to drift over the southern part of the region. A second storm approached and it seemed the intercept would require to be on the northern side. Just out from North Dorrigo, the storm made its impact. Lightning again began piercing the earth! Some very loud thunder making for some nice audio. Suddenly, I saw a lightning bolt perhaps kilometre away followed a short time later by anorther. I aimed the camera in anticipation. Wow! What a ripper. Dead centre and within 300 metres! The lightning bolt hit neat a farmhouse just below my vanyage point. I signalled to Nick that I got this one. With the storm now out of touch in the area, we decided to call it a day as the rest of the day became thundery rain from an approaching squall line.